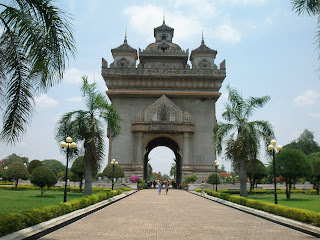 Laos! Just north of Thailand, we had to check it out! 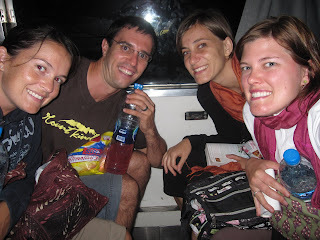 Annet, Terra, Daniel and I loaded the over night train, 13 hours, to the border. Unfortunately, we weren't quick enough to get a sleeper train, so we slept sitting up (it’s amazing the kind of sleeping pill they sell in Thailand). Once we arrived to the border, we had the very long process of border crossing. Not only do you meet the most interesting people from around the world, but you just have this weird feeling that something bad is going to happen and you play every scenario in your head about what possibly could be wrong with you or your passport. 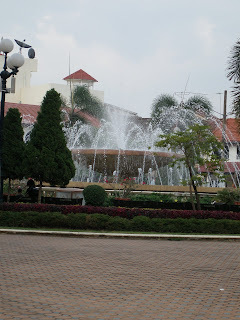 Still extremely tired from the night of sitting-up we arrived to the capital city of Vientiane. It is known as the most laid back capital city in the world. And….it is! There really isn’t much going on there, but I think that’s what makes it so great! 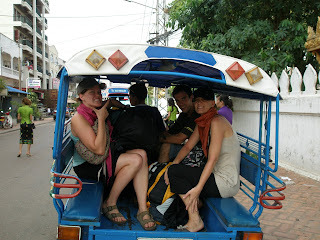 We instantly rented bikes for about a dollar a day for two days so that we could have some transportation. 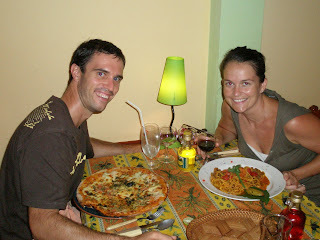 Once we got a hotel and started to experience what’s so great about Laos…..their food! 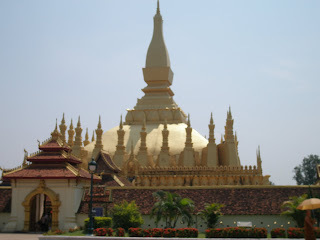 Since Laos was occupied by the French, they have some of the best cafes, bakeries, and restaurants. Asia’s cuisine isn’t into 'good tasting' baked goods much, so it had been a while since we had good breads and sugary treats! Renting the bikes were a great and cheap way to get around the city and see the French style buildings, the Mekong River, and famous landmarks like the “Ac de Triumph”. My morning runs always took me up there to run around and feel like I was in Paris! 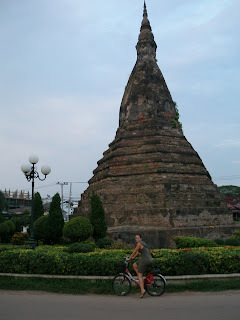 The bikes also took us to get wonderful massages, to eat and to visit some temples (it wouldn’t be a trip in Southeast Asia if you didn’t see a few). 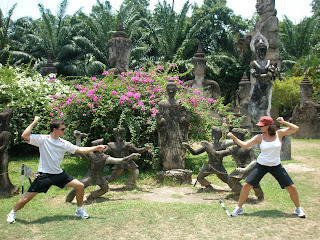 One day, we thought we would be very adventurous and ride our bikes out to a famous landmark, Buddha Park. It was about 25 Km away so we knew it would take awhile especially since our bikes weren't built for long distances. The baskets on the front, the high handle bars, and the unajustable seats…but we needed to work off those baked goods! So, we headed out. The first hour wasn’t bad. We were riding though rice fields, small towns and had lots of people yelling and honking at us along the way. The remaining 4 km felt the farthest. 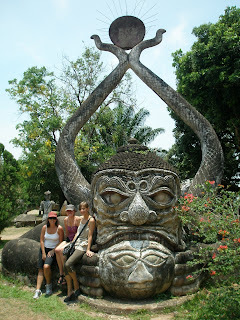 Once we arrived to Buddha Park, we were so sweaty and happy to be off the bikes! Buddha Park was pretty much like it sounds. 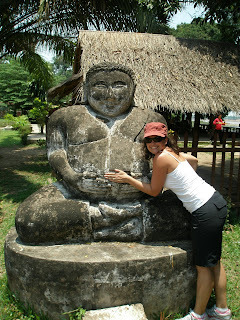 It was a very small park with tons of Buddha-esque sculptures. All of them representing some sort of …..I don’t know! We were all dreading the fact that we had 25 Km to ride back! Trying to think of a way to avoid it, we saw a random Laotian get into his truck. SO, we ran over to him and somehow convinced him to take us and our bikes back (we got over 1/2 of the way back, the rest was doable). Of course, he thought we were completely crazy and had no clue what we were saying, but I think our hand motions helped! 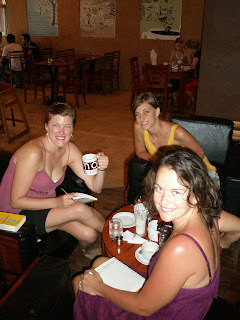 After that adventure, we all deserved an afternoon of hanging out in cafes and relaxing. The n ext day, we had to start our journey back home. 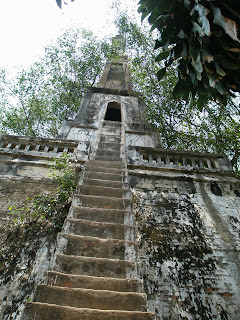 We soaked up the last of Laos and started back on our border process again. 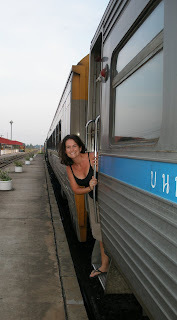 When we got to the train station, we were very excited that we had a sleeper train for our overnight ride. 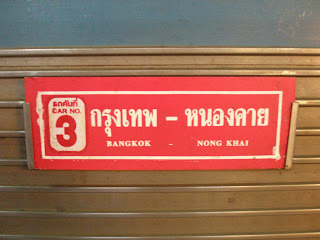 We arrived back in Bangkok early the next morning feeling great! 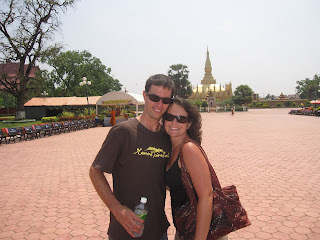 It was a great way to experience Laos with friends and food!